A couple of specially decorated spice jars filled with heart shaped confetti. 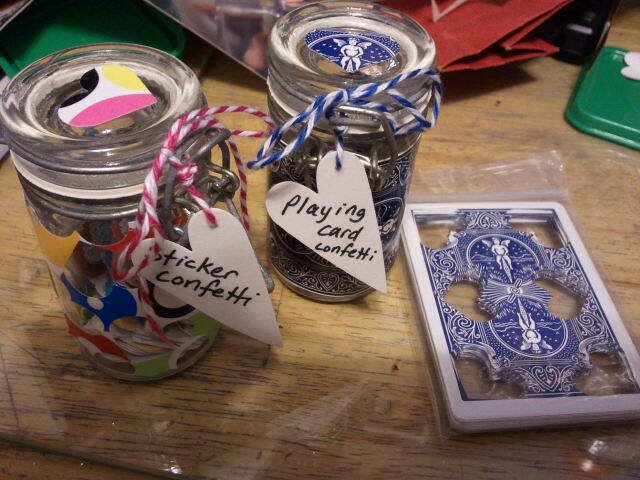 The confetti in the blue jar was punched from playing cards, the second one from sticker sheets. These may never leave my shelves, as I can see so many uses for the cool shapes. I found a stash of small old pimento jars and will be decorating them as well. 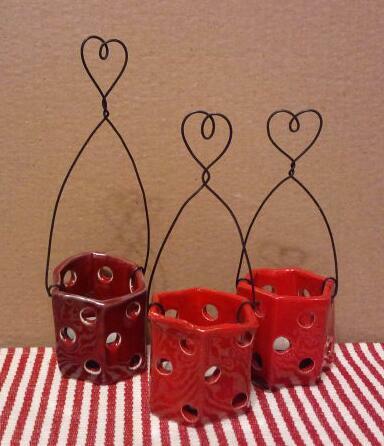 Found these great ceramic tea lights and fashioned the wire hangers/handles. The irregular holders are very organic in design, and with their new handles, they are darling! Again, I may have to keep a couple of these for myself. I have been clearing off my desk top, making space for a sewing machine. As soon as that is set up, plenty ‘o stitching will be goin’ on! Join me here again tomorrow with the latest installment of the heart chronicles. I need to find just the right thing to dangle from the bottom, but otherwise, this is DONE! 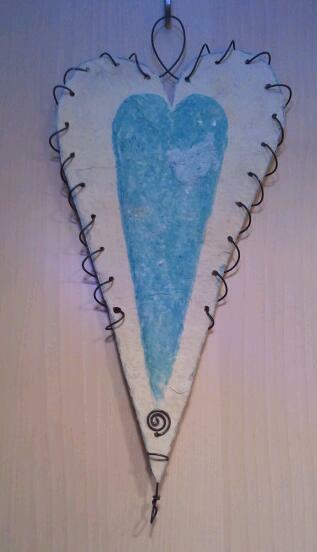 Woke up this morning at 5:00 a.m.
Lots of twisty wire, mat board, paper mache. Now I will clean off my desk and set up the sewing machine, after a hot cup of coffee. Thanks for looking! p.s. Notice the heart in the center? 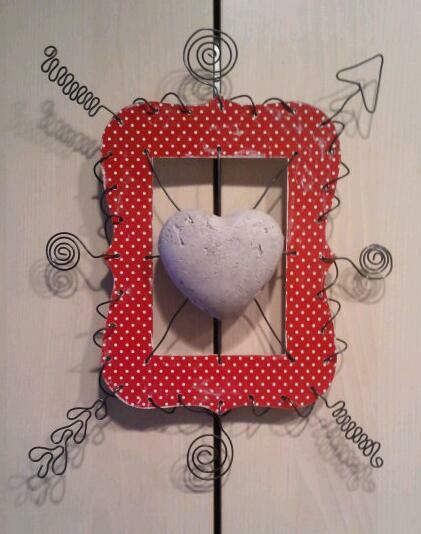 It is from my day of paper mache making. Watch for more of these hearts making their way into projects! This is a fun project. 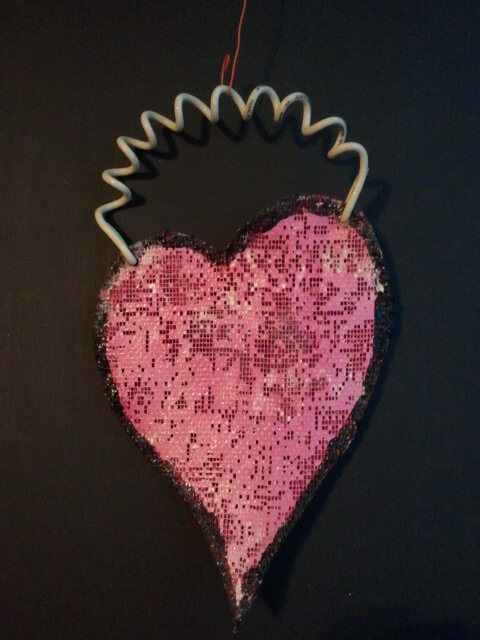 Another heart down, thousands to go!